Reuters recently put out this article: Eating healthy food costs more money in U.S. (than eating junk food). This is a bit of a no-brainer, isn’t it? For example, here’s the cake I made for my husband. Yesterday was his birthday and he likes carrot cake. I could have whipped up a Betty Crocker cake mix for $1.48 and plopped it in the oven within five minutes—complete with its hydrogenated oils and carrot flavored pieces. Flavored, mind you. 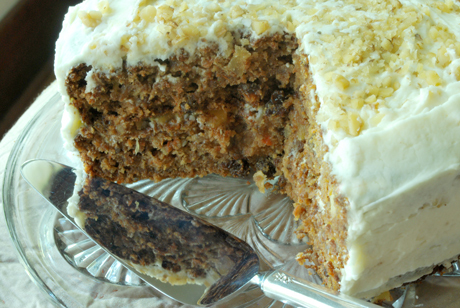 Instead, I made this carrot cake from scratch. It’s a recipe from Beans and Barley Restaurant in Milwaukee and it serves up the complete food chart in a single slice—all real, all natural. I even ramped up its foodie goodness by using butter instead of vegetable shortening and homemade yogurt instead of buttermilk. It’s so-o-o delish. Needless to say, this cake took more than $1.48 and five minutes to make. Reuters is right. Healthy food does cost more, both in time and money. But did you read the comments in the article above? They lead one to reconsider if, in the long run, eating healthy really is more expensive. Isn’t it true that eating better food equals better health? I’d much rather invest in my own good life than a pharmaceutical stockholder’s. And I certainly prefer spending time cooking together with my family over sitting in a doctor’s office. This same concept applies to business. Business and marketing. As small business owners, we often think we can’t afford quality marketing. It’s cheaper to shoot our own photography, write our own copy, or pay a few bucks to someone “handy with the computer” for doing our design. But is quality marketing really that much more expensive? Professionals, whether they’re photographers, copywriters or graphic designers, are specially trained to make you look good. They know how to attract and motivate your audience. They know how to get results. Last fall I bit my financial bullet and participated in Marketing Mentor’s workshop for creative business growth. It spanned six months and for a solo entrepreneur like me, it was a major commitment. But it was so well worth it. My business return has been much greater than my investment. Yes, it’s another bite in my budget. And yes, it will require a daily commitment. But I feel it’s healthy food for my business. It will teach me healthy marketing and will pay off in the long run. Check it out. What about you? What healthy things are you doing for your business? Speaking of social media: Be sure to join Adunate on Facebook and Twitter. And stay tuned, I’ll share what I learn at Bootcamp!